We arrived at Los Tarrales in time for a late lunch and a short rest before hitting the trails. Throughout our trip, a guide in training, Aarón, joined us. 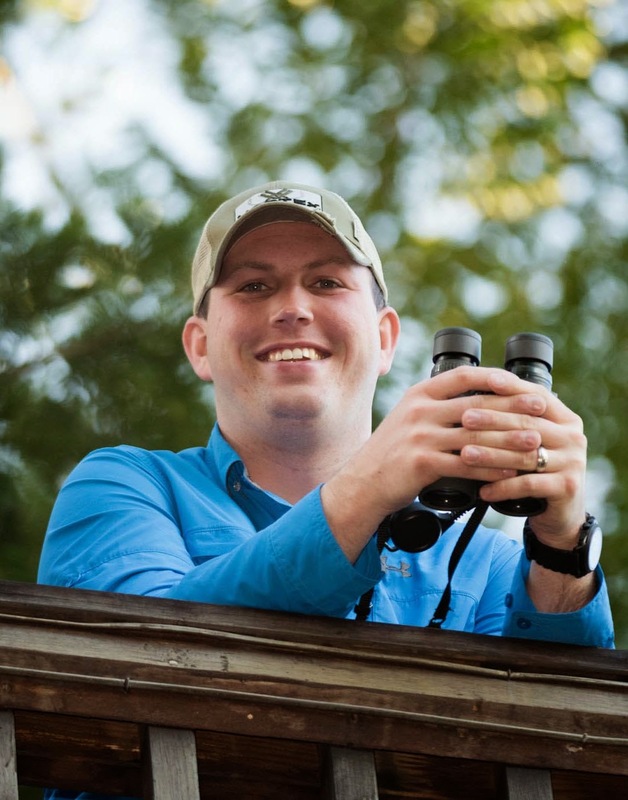 He is a great birder and is going to be a great guide very soon! While at Los Tarrales, we learned that two of his brothers are also guides and they work locally at the lodge. Throughout our stay here, it was really fun to bird with the three brothers. Be sure to also hire Lester and Josue when you are at Los Tarrales! 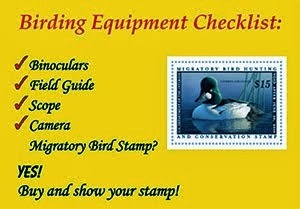 Not only is it good for the local economy, they know where all of the birds you want to see are. It was hot when we started out that day, but the birds didn't seem to mind. Just a short way down the path, we heard a Striped Cuckoo, but even though it sounded very close, we couldn't hunt it down. A bit later we had wonderful views of a Blue-throated Goldentail. As we approached part of the trail that is good for Long-tailed Manakin, a much larger creature caught our attention - a Tayra! The Tayra is a large weasel. We spotted it high in a tree, and after a short time it ran straight down the trunk and out of sight. It was a life mammal for me! 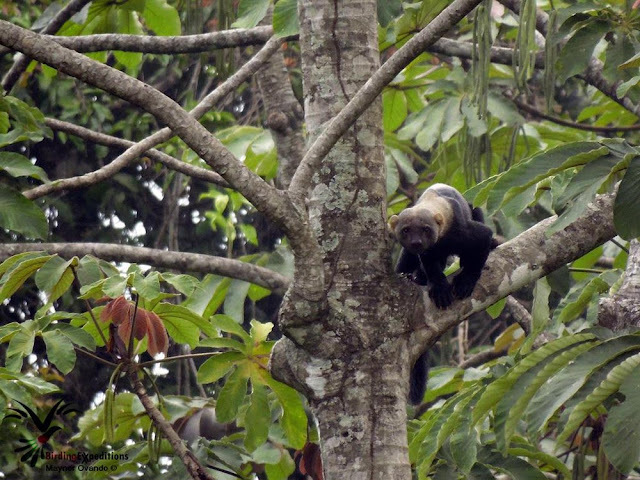 This Tayra was one of the highlights of the trip. Thanks to Maynor Ovando for the photo! Just after seeing the Tayra, we got fantastic views of the Long-tailed Manakin that we were searching for then headed back to the lodge to get some rest. We rose early the following morning and loaded into 4x4 vehicles to make the trek up the mountain to look for the highlight bird of Los Tarrales, Azure-rumped Tanager. It was a beautiful drive through coffee plantations with the plants in full bloom and wonderful forest. 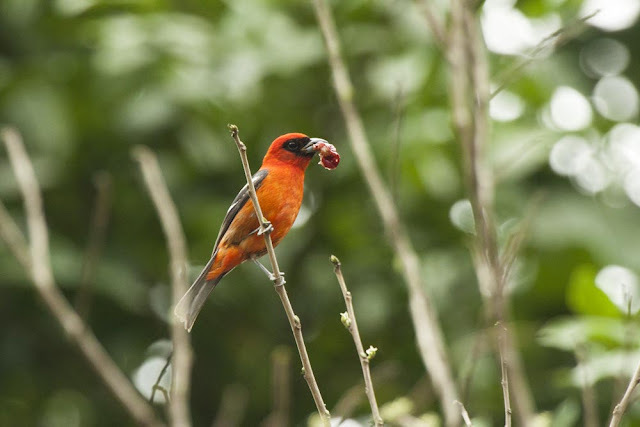 Although our views of the tanager were from a distance, we did get to watch them build a nest! In addition the the tanager, other highlights included Buffy-crowned Wood-Partridge, White Hawk, and Prevost's Ground-Sparrow. 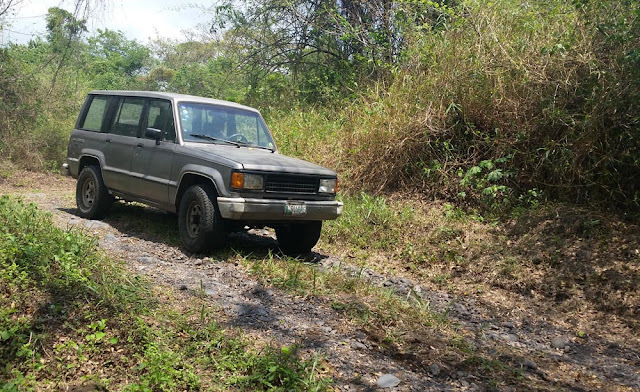 Our 4x4 ride up the mountian. 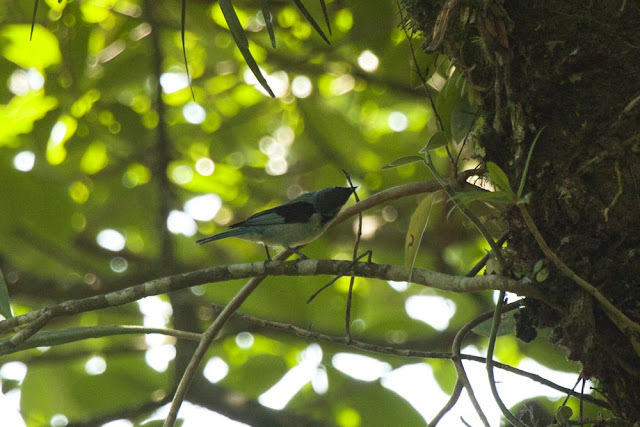 The Azure-rumped Tanager one of the best birds at Los Tarrales. We spent the afternoon and the following morning exploring more of the property and adding many species to our growing list. By the time we packed up and started for Quetzaltenango, we had seen 125 species at Los Tarrales. 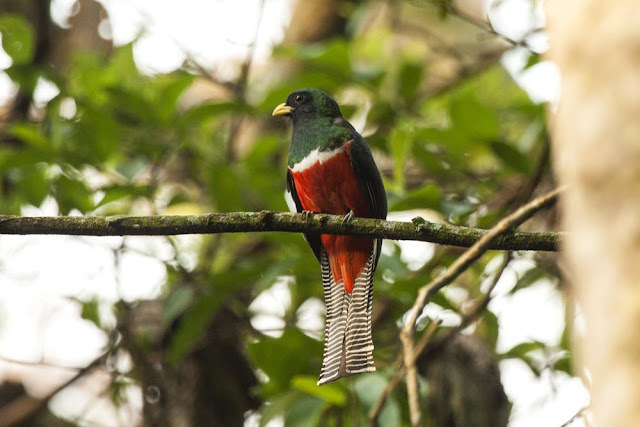 This Collared Trogon posed nicely for me. 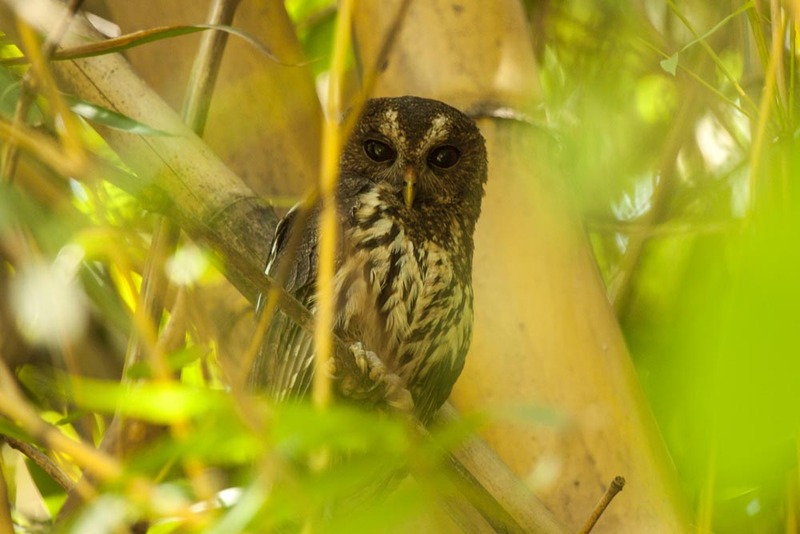 Two Mottled Owls were roosting in the bamboo. Until this trip, I had never been able to get good photos of a White-winged Tanager. It took the entire afternoon to travel to our next hotel, so we didn't get much birding in. Our day started early again as we moved to our next birding spot, Fuentes Georginas. This area is situated up in a valley and is a popular hot springs with fantastic birding! Unicolored Jays are extremely common at Fuentes Georginas. 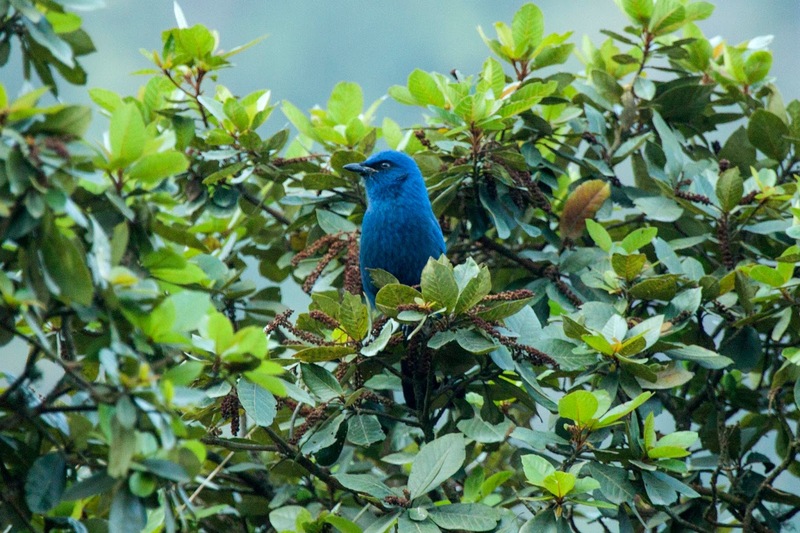 As with many higher elevation areas, the number of species isn't high, but the quality of each bird is! Highlights for the morning included Amethyst-throated Hummingbird, Pine Flycatcher, Unicolored Jay, and Cinnamon-bellied Flowerpiercer. Once we were done with our morning birding, we packed up and made our way towards Posada de Santiago on Lake Atitlan where we would making a very difficult hike in search of Horned Guans. Check back in a couple days to hear about our adventurous day in search of the guans!